According to final data of the 2002 Census, the population of Slovenia was 1,964,036. Since the 1991 Census the number increased by 2.6%. The increase by 50,681 persons is the result of immigration from abroad (28,000 persons since 1991) and the legalisation of residence of former Yugoslav citizens who already lived in Slovenia in the period of the 1991 Census. Natural increase between the last two censuses was negative (by 3,500). The most significant demographic processes in the 1991-2002 period were the increase of the number of households by 8.3%, the decrease of the average household size from 3.0 to 2.8 and the increase of consensual unions from 17,000 to 42,000 (index 242). 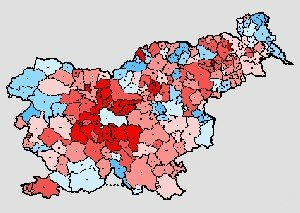 Compared to the previous census, the number of dwellings for permanent or occasional use in Slovenia increased by 94,635 or 13.9%. The share of occupied dwellings decreased in comparison with the 1991 Census.